The bagua linear pole form, is a power building form, for both your physical muscle power, as well as your internal fa-jing power. Simply practicing this form, even at a slow pace, due to the size of weapon and what we do with it in the form, will give a great upper body workout. It also has some lovely low postures, as well as some leaps and kicks. So when it come to fitness, this is the form for you! 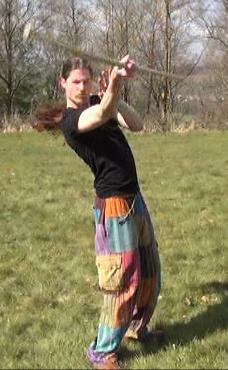 This is a Fa-jing form, and so again with the weight of the pole in your hands, performing Fa-jing in this way will enhance the power of all your other weapons training, as well as your empty handed training. There are some fancy moves through out, as you would expect from a weapon form, but it also has some very practical and deadly aplications of Dim-Mak, all shown on the DVD. Performed and Taught by Eli Montaigue. Each DVD is packed with almost 2 hours of information.